Now that summertime is creeping upon us, I have been brainstorming ideas of easy snacks and breakfast items that are simple to make and not time consuming. Granola has always been a favorite of mine, but buying boxes at a time can really start to add up cost wise. 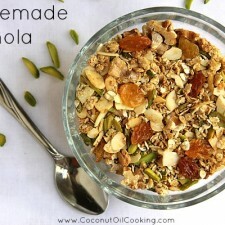 To help solve my granola dilemma, I decided to create a recipe of my own to make from scratch. I can’t begin to explain how much fun this was and not to mention, super easy! I love the fact that you can literally put in any of your favorite nuts or dried berries/fruit and have a delicious mix. Preheat oven to 325 degrees F. Spray a large baking sheet with Kelapo Coconut Oil Cooking Spray. In a small saucepan, combine maple syrup and coconut oil on a medium-low heat and bring to a simmer. Be sure to constantly stir this for about 5 minutes. Take mixture off heat and stir in vanilla extract. Set aside. Next, place all remaining ingredients into a large bowl. Drizzle with the syrup mixture and be sure to stir well to fully coat all ingredients. Spread the granola mixture evenly on the prepared baking sheet. Place the baking sheet into the oven, leaving it fully in the oven for the first 10 minutes. After 10 minutes, be sure to stir the mixture and place back into the oven. Continue this process for approximately 30 minutes or until the granola is a nice golden brown. 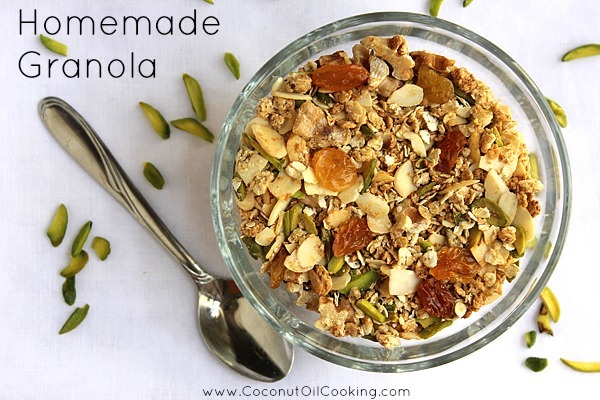 Once the granola is baked to your liking, remove from the oven and let cool. Place granola in a sealed container and place in the refrigerator for storage. This recipe turns out absolutely amazing and you can double the amount of ingredients to make a large batch! Feel free to add chocolate chips to your finished product to make a trail mix or serve up a bowl with almond milk for breakfast. For more snack ideas, be sure to check out our recipes for Peanut Butter Pretzels, Crispy Apple Chips, and Coconut Chili Lime Popcorn.